Sony looks set to name its PS3 Motion Controller "Arc", according to latest reports from those close to the project. The device was previously referred to internally at Sony as 'Gem' but it looks like it is finally about to get its name that we will all refer to it as for years to come. Sony has not been available for comment on the rumours, but stay tuned for updates. The company's new motion controller – whatever it turns out to be called – is a key part of PlayStation's strategy to stay ahead of the game, with Sony hoping to offer a range of playable motion-control games at this years' Games Developers Conference in March and at E3 in June. 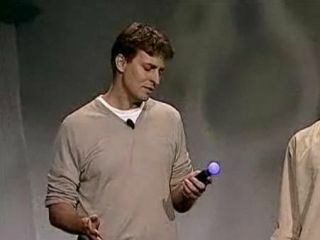 Sony clearly hopes that its new 'Wand' device will help them make better motion-controlled games than Nintendo or Microsoft. The bizarre-looking device has a trackable ball and is fully compatible with the PSEye camera.